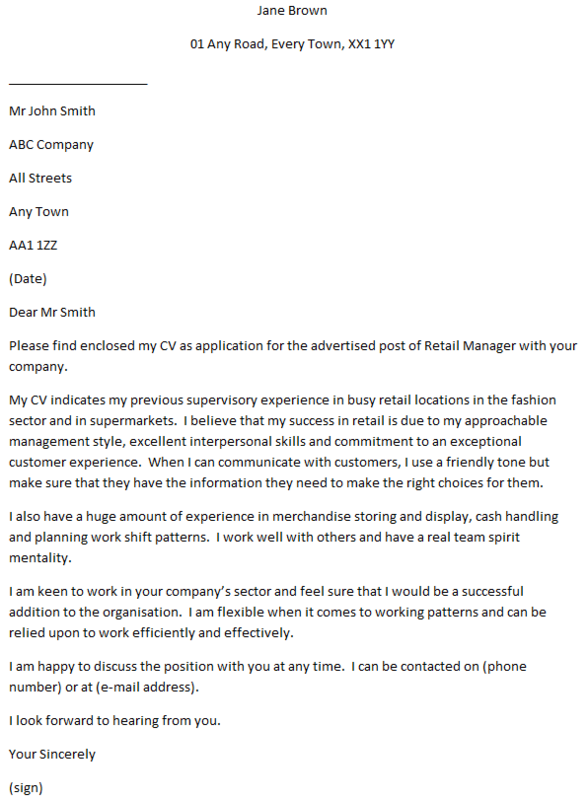 Cover letter example for a retail manager job. You can amend this letter as suitable and apply for latest job vacancies. I would like to apply for the position of retail manager of your Solihull store as advertised in the Birmingham Post last week. I have enclosed a copy of my CV which shows that I have considerable experience in similar positions. I thoroughly enjoy the role and feel that it is important to spend as much time as possible on the floor so that I am accessible to the department heads and junior staff when required. Although there is the inevitable administration which always takes the manager away from the “front line” it is essential that all staff members are able to see that I’m available to discuss day to day business without them having to knock on my door. I am particularly interested in your vacancy as it offers me an opportunity to build on my experience of managing smaller stores. Your organisation has an extremely good reputation for the quality of the products. There are branches in most of the towns and cities in the UK and knowing that I can be transferred to other, larger stores over a period of time, is an exciting proposition. I look forward to attending an interview at a time convenient to you. Thank you for taking the time to read my application. I hope to hear from you in due course. Please find enclosed my CV as application for the advertised post of Retail Manager with your company. My CV indicates my previous supervisory experience in busy retail locations in the fashion sector and in supermarkets. I believe that my success in retail is due to my approachable management style, excellent interpersonal skills and commitment to an exceptional customer experience. When I can communicate with customers, I use a friendly tone but make sure that they have the information they need to make the right choices for them. I also have a huge amount of experience in merchandise storing and display, cash handling and planning work shift patterns. I work well with others and have a real team spirit mentality. I am keen to work in your company’s sector and feel sure that I would be a successful addition to the organisation. I am flexible when it comes to working patterns and can be relied upon to work efficiently and effectively. I am happy to discuss the position with you at any time. I can be contacted on (phone number) or at (e-mail address).